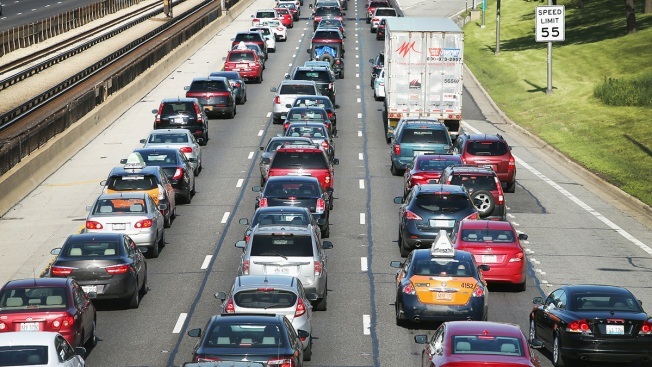 This May 23, 2014, file photo shows cars in Chicago. First-quarter auto sales are expected to drop 2.5 percent from a year earlier. The average price of a new vehicle is expected to hit $33,319, the highest ever for the first quarter. Automakers prefer making pricier trucks and SUVs over cheaper cars. U.S. auto sales are falling as vehicle prices climb, indicating that buyers at the lower end are getting squeezed out of the new car market, according to a new industry forecast. First-quarter auto sales are expected to drop by nearly 2.5 percent from a year earlier, to 4 million units, according to J.D. Power and LMC Automotive. Retail sales, which exclude sales to rental car companies and other commercial businesses, are expected to drop by about 5 percent to 2.9 million units. It’s the first time first-quarter retail sales are projected to fall short of 3 million units in six years, said Thomas King, senior vice president of J.D. Power’s data and analytics division. It’s more evidence that vehicle sales in the world’s second-largest auto market are sliding from the record levels they had achieved in the years following the financial crisis. While sales volumes are softening, especially for cheaper cars, customers are still paying remarkably high prices for cars, King added. Prices are hitting monthly records while retail sales of vehicles that cost under $25,000 are expected to fall 12 percent in the quarter, more than double the overall decline. The average price of a new vehicle is expected to hit $33,319, the highest ever for the first quarter. The average buyer is paying $1,000 more per purchase than in the first quarter of 2018. The data suggest that more and more buyers are getting squeezed out of the new vehicle market and are likely turning to used cars as manufacturers pull back on cheaper vehicles, said LMC Automotive President of Global Forecasting Jeff Schuster.